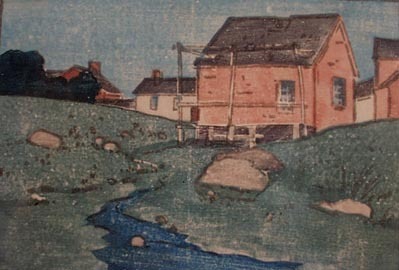 Ipswich Prints, (1901-06). There were three sets of the these little packets of 6 prints each published by Dow. They were printed by hand from metal relief blocks and were issued primarily as teaching aids. Some of the designs are in color and others black and white. Some are designs by Dow and others Oriental designs used to exhibit his theories of art. I am interested in complete sets and single prints. The third set is all copies of the Oriental designs and is of least interest. I will buy the portfolio covers and the title sheets alone (i.e.without any prints) if they become available as I have some sets of prints without covers. (Note: these prints often have letterpress titles and other notations). Arthur Wesley Dow Association: There was an organization by this name based in Los Angeles in the 1920's and perhaps later. I know little about them, but am interested in buying items related to it. Dow's woodcuts are usually small-often as small as 2 x 4": and uncommonly larger than 4 x 6": (although he did prints up to 8 x 10"). It is not uncommon to find unsigned works by Dow and while a signed print is generally worth more, unsigned prints still bring good prices.